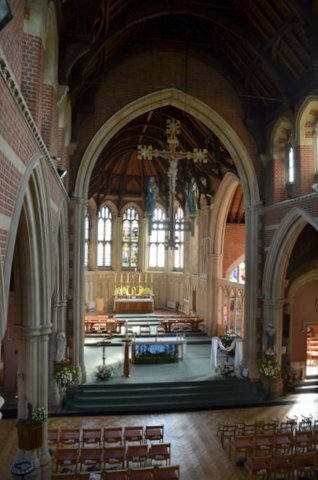 All Saints' Church is a Church of England community where the Catholic Faith is taught and practised. to the glory of God by validly ordained priests and bishops. We praise God in the beauty of holiness and rejoice in the traditions of the Catholic Church. All Saints' Church is affiliated to The Society (under the patronage of Saint Wilfrid and Saint Hilda) and is served by a priest of the Society of the Holy Cross. We welcome all people of good will to share our life. Prayer requests are gladly accepted. Every person has a value and dignity, which comes directly from the creation of people in God’s image. Christians see this potential as fulfilled by God’s re-creation of us in Christ. Among other things this implies a duty to value all people as bearing the image of God and therefore to protect them from harm. We commit ourselves to nurture, protect and safeguard all our members, particularly children, young people and adults at risk. We recognise that safeguarding is the responsibility of the whole church. We undertake to exercise proper care in the selection, appointment, training and support of those working with children or vulnerable adults. We will respond without delay to concerns or allegations that a child or vulnerable adult may have been harmed, cooperating fully in any investigation. We will seek to offer pastoral care to anyone who has suffered abuse. The PCC has appointed a Church Safeguarding Officer and Children’s Champion, as required by the Diocesan policy. Who to contact and where to find us.